Photo by Dominique Plachta, 2010. Ronald Searle (1920 – 2011) was a British artist, cartoonist, and illustrator for film and books. He is perhaps best remembered as the creator of St Trinian's School, a series of cartoons about a fictional boarding school for girls, which was later brought to the silver screen in seven films made between 1954 and 2009. Searle's professional career began with his documentation of the brutal camp conditions while he was a prisoner of war of the Japanese during World War II. He produced a series of drawings that he hid under the mattresses of prisoners dying of cholera. 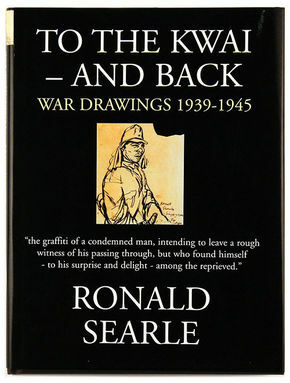 Most of these drawings appear in his 1986 book, Ronald Searle: To the Kwai and Back, War Drawings 1939-1945. He was liberated in late 1945. Immediately after the war, he served as a courtroom artist at the Nuremberg trials. Searle produced an extraordinary volume of work during the 1950s, including drawings for magazines Life, Holiday, and Punch. 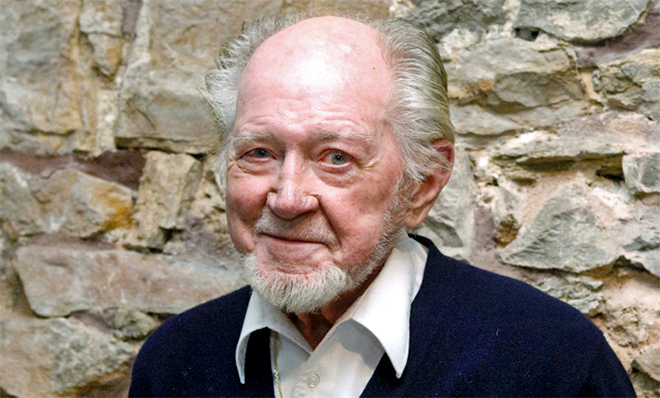 His cartoons appeared in The New Yorker, the Sunday Express, and the News Chronicle. He drew the title backgrounds of the 1950 comedy film The Happiest Days of Your Life, a precursor to the St. Trinian's films. He went on to illustrate dozens of books as well as the opening titles of many more movies, including the majority of the St. Trinian's films, Those Magnificent Men in Their Flying Machines (1965), Those Daring Young Men in their Jaunty Jalopies (1969), and Scrooge (1970). Searle died on 30 December 2011, aged 91. His wartime drawings are now part of a permanent collection in London's Imperial War Museum. 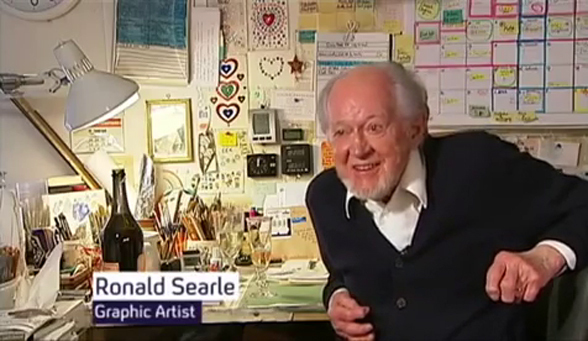 2010 Channel 4 interview with Ronald Searle, titled "A Life in Sketches"